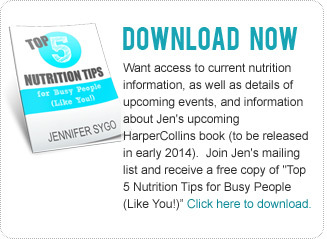 An engaging and sought-after speaker, Jennifer provides her nutrition expertise to thousands of individuals at corporate events, for industry groups, to sports teams, and at medical conferences each year. Her clients include Kellogg’s, Petro-Canada, RBC, GE, ScotiaCapital, Johnson & Johnson, Hockey Canada, Skate Canada, and many more. While Jennifer takes pride in having an in-depth understanding of today’s nutrition issues, she is known for turning challenging topics into simple nutrition solutions with a sense of humour and down-to-Earth style. Her talks routinely receive top rankings, and she has a substantial number of repeat clients. Read some of Jennifer’s testimonials. Prior to her talk, Jennifer will work with you and your team to ensure that her talk meets your organization or conference’s particular needs. Book Jennifer for your next event by completing the form below.